Australia is a Parliamentary Monarchy, is part of the Commonwealth of Nations and is separeted in the states Australian Capital Territory, New South Wales, Northern Territory, Queensland, South Australia, Tasmania, Victoria and Western Australia. Capital city is Canberra. The country with about 21 Million habitants you find at geographical latitude from 10° south to 44° south and geographical longitude from 112° and 155° east in the southern hemisphere. Due to the dimension of 7,7 Million km² Australia contains lots of climate zones like the tropics in the north and the temperates in the south. At the southern hemisphere you can watch clearly the Southern Cross at night in all the stars in the sky. The seasons are the opposite of them in the northern hemisphere like in Europe, North America or Asia. sommer is in the months from December to February, fall from March to May, winter from June to August und spring von September bis November. Because of the geolotical isolated location in history a special Fauna and Flora were developled. Wild plants switch the dry graslands and the dry outback of Australia into a wet and colorful country after rainfalls at the beginning of the year. In Australia are a lot of Nationalparks to protect nature and culture. 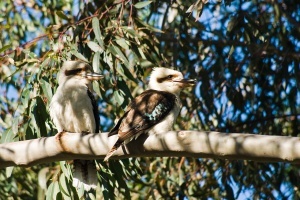 One of this parks is the Kakadu Nationalpark in north Australia near Darwin. The Kakadu Nationalpark is special because the park is under the protection of the UNESCO as World Cultural Heritage and World Natural Heritage. There you can watch a lot of Rock Paintings of the Indigenous People. A conflict of interests is the resource of Uranium in the park. Another well known park is the Uluru - Kata Tjuta National Park. The Uluru - in history known as Ayers Rock - you see an unreal mountain as the sanctuary of the natives in the center of Australia. After living in lots of different clans about 40000 years as hunters and gatherers the Aborigines were cruelly killed by the Europeans. In 1836 the scientist Charles Darwin visited and documented Australia. Amazingly in 1957 the last clan of the natives was discovered. After a lot of wars the Europeans took the children of the Indigenous People (in former times calles "Aborigines"). This stolen children were "half-caste" (Text only available in German!) and this children of the Indigenous People and Europeans became famous as the Stolen Generation. 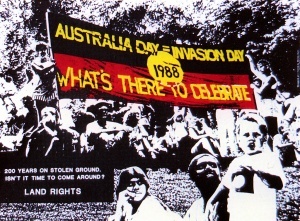 Fighting for their rights the natives wrote the Bark Petition (1963) and the The Barunga Statement (1988). As a first Australian Government Primeminister Kevin Rudd said sorry in 2008. The Apology to the Stolen Generation of Australia was transmitted all over the world. In modern times the tourism became more and more important like the agriculture and other economic interests. While singing the National Anthem at a sport event the guests in restaurants are singing the folksong Waltzing Matilda. The number of tourists traveling by railway increases every year. The new Ghan is a nice train to watch the country. 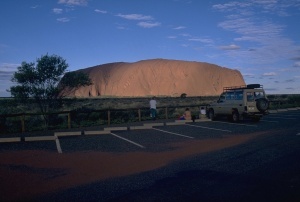 Classic places like Alice Springs to travel to the Uluru or the Great Ocean Road are part of the schedule. Everywhere in Australia you will see the Didgeridoo a music instrument. You should use the daylight while travellung in Australia and you should know the Daylight-Time and non Daylight-Time. In one year about 250000 Europeans visit Australia (about 60000 Germans) to see this beautiful country. We have a lot of maintenance work causing errors an issues. This page was last modified on 6 June 2012, at 16:52.